Santa Cruz’ noteworthy Cabrillo Festival of Contemporary Music opened its 49th season last weekend. It also celebrated its twentieth anniversary under the energetic leadership of Marin Alsop. 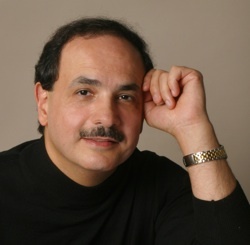 Many of the composers were there in person to be part of a festival that has achieved cult status at home and is increasingly recognized abroad. Wending my way through this laid-back beach town I passed streets named Water, River and Ocean on the way to the Civic Auditorium, where the annual Arts Fair was also being held. Booths selling beaded wine glasses, kettle corn and hand-made quilts crowded around a raised stage, where Senegalese Reggae group Koumbemba had its audience swaying and clapping. Much of that casually clad audience—surfers, music professors, and runaways, perhaps—surged into the Auditorium a few minutes later when the doors opened. 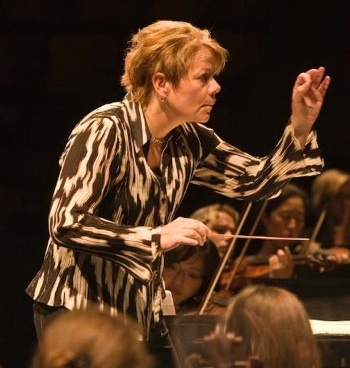 The real story here is of Marin Alsop, whose humor, empathy and ferocious intelligence have earned her the respect of the musicians, many of whom travel from all over the country to serve under her baton. Alsop’s tenure has added an international flavor, and on Saturday the composers hailed from Iran, Russia and Japan, with featured French pianist Jean-Yves Thibaudet leaving the next day for Europe. Alsop’s high profile has also inspired a new generation of young women conductors. In a talk-back session after Saturday’s concert, Alsop was asked if she wanted to conduct everywhere in the world, after her program bio mentioned that in addition to the Baltimore Symphony she is the new chief conductor of Brazil’s São Paulo Symphony Orchestra. She replied that what mattered to her most was neither expertise nor material, but the commitment of the community. She is obviously much loved in Santa Cruz, where her visage flies on banners throughout the town. The other story, perennially, is of the direction of modern music. Asked about this, composer Behzad Ranjbaran said he saw “a trend towards more accessible music and more fusions. Composers have gone through a rejection of the past and recognized that music has to communicate with an audience.” That did seem to be true of the evening’s samples. I had tickets for the second night, August 6, a concert titled “Summer,” named after a jazz-inflected tone poem by Shuko Mizuno. 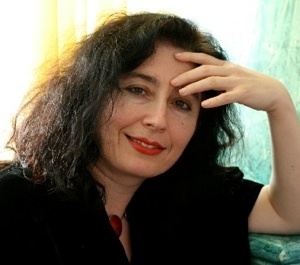 That concert began with Uzbekistan-born composer Elena Kats-Chernin in a tribute to Argentinean composer Astor Piazzolla. Re-Collecting ASTORoids created a windswept vista with distant shimmers and soft rising triads, then trumpets entered with grace notes and glides for a perfect tango. These danceable rhythms were a gentle transition from the driving themes of Senegal and West Africa outside the hall. Kats-Chernin quotes Piazzolla’s adjacent chords, shifting harmonies with swamp-like authenticity. Her “Tango” movement was sharp with rotating accents, a driving three against four, then turns languid in “Walking.” The noir movement was snaky with trumpet mwah’s and mutes, and the final movement treated the motifs to rotating fifths for a delicate finish. Her variations reminded me of television’s Iron Chef, where the mystery ingredient would rise up out of the steam. Kats-Chernin used her motif for appetizer, main dish and ice cream. And the audience ate it up. And the impact? Fear amid the trappings of war. Even doing “festive,” Ranjbaran alternated piano cadenzas with brass and gunshots, perhaps the result of growing up amid secret police, revolution and iron theocracy. Thibaudet was featured the night before, in James MacMillan’s Piano Concerto No. splay of virtuosity in Ranjbaran’s concerto. A difficult double header, it was made fiendish with tricky cross-rhythms and broken-field runs. At times he held trills with the right hand while running up and down the keyboard with the left. His third cadenza sounded like four-hands piano, with paired high and low voices. The middle movement was gentler, with violin shimmers and chromatic horns, stepping down for tangy overlaps, followed by soft piano arpeggios like a Persian Moonlight Sonata. But Ranjbaran’s heavy-footed theme returned, and Thibaudet’s answer felt like twenty ways to fall down the stairs. The title composition closed out the concert. These days, when Alsop travels she is often held hostage to contemporary CD’s. When last in Japan, she was asked to listen to recordings of current Japanese composers, and Shuko Mizuno’s Kokyoshi “Natsu” (Symphonic Poem “Summer”) stood out. Alternating lyric beauty and violin solos with storming tutti passages, it held some of the loveliest moments of the evening. Photos (from top): conductor Marin Alsop, photo by rr jones; composer Elena Kats-Chernin; composer Behzad Ranjbaran, photo by Peter Schaaf; and Jean Yves Thibaudet. The festival returns Saturday, August 13 in Santa Cruz with four more composers, and a final concert Sunday, August 14 at the Mission of San Juan Bautista, where Cabrillo always closes. More information is available on the website at cabrillomusic.org.